A30 Devon both ways severe disruption, from A35 Monkton Road to A303. A30 Devon - A30 closed and slow traffic in both directions from the A35 Monkton Road junction in Honiton to the A303 junction in Upottery, because of an overturned car. 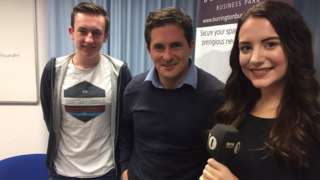 Conservative MP Johnny Mercer says MPs have been put in a "really difficult position". MP asks voters: What do I do about Brexit? Johnny Mercer takes to the streets of Plymouth to ask the public what she should do in the Parliamentary vote on 11 Decemer. A3047 Cornwall both ways severe disruption, from Rosewarne Road to Church Street. A3047 Cornwall - A3047 Commercial Street in Camborne closed in both directions from the Rosewarne Road junction to the Church Street junction, because of a building fire. Jessie Humber says Dean Davies stopped her head hitting the ground when she broke her neck in a tackle. Givemore Gezi denies committing sexual offences against a 15-year-old girl he was caring for. Hundreds of people who threw their wellies in the air at the Holsworthy and Stratton summer show have made it into the Guinness Book of World Records. In August 792 people simultaneously threw wellies to break the current world record of 636. Show secretary Rosie Ireland organised the event "to bring together people from farming and non-farming communities" and said she was "thrilled, really, really pleased". Residents of flats in Seaton, in East Devon, are going to spend a second night in a hotel, after a fire severely damaged their homes. Firefighters were called to the Royal Clarence building on Harbour Road at about 07:49 on Sunday. Fifteen flats were evacuated as fire crews fought the blaze. A floor collapsed inside and several flats were "substantially damaged". Police and a fire investigation team has been on site examining the properties and residents are waiting to hear when they will be allowed back. Resident Simone Sibbald said she was touched by how the people of Seaton had rallied to help: "The community has been brilliant. The Red Cross has given me shoes, the people in the Hook and Parrot supplied teas and coffees, the emergency services have been really amazing." The police have arrested a man on suspicion of arson with intent to endanger life. A drug user has been given a suspended jail sentence for helping a killer move the body of a man stabbed to death with an ornamental carving fork. Neal Hinton was called in the middle of the night by drug dealer David Ablett, who had just murdered customer Matthew Jackson at his flat in Teignmouth. Ablett was desperate to distance himself from the killing and got Hinton to drag the body across the road and leave it next to wheelie bins on the other side of Barnpark Terrace. The cover-up failed because the two men left a trail of blood which led straight back to Ablett's door. 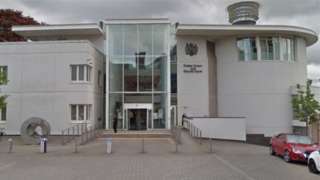 Ablett, aged 52, was jailed for life at Exeter Crown Court after being found guilty of murdering 38-year-old Mr Jackson during an argument about drugs and money. The court heard Hinton, 39, of Ness View Road, Teignmouth, went to the flat and agreed to move the body because he was frightened and confused. He admitted perverting the course of justice and was jailed for a year, suspended for 18 months, with 30 days of rehabilitation activities by Judge Peter Johnson at Exeter Crown Court. The court heard Hinton had a background of mental health problems and his vulnerability had been exploited by others throughout his life. He described it as "a horrible night". Secondary school tables just published show one in eight in England is below government standards. Primary school league tables show pupils with special needs are dropping further behind their classmates. Crossing the Tamar Bridge from Cornwall into Devon is set to get more expensive, with plans to increase tag payments by 25%. Proposals have been drawn up to increase the cost of using a TamarTag from 80p per crossing to £1. The increase is part of a full review of toll charges to raise money for improvements to the bridge and ferry control system. The plans are set to go before a meeting of Cornwall and Plymouth City Councils' Tamar Bridge and Torpoint Ferry Joint Committee on Friday. A report going to the committee states that the TamarTag increase will generate an extra £116,500 a year which would ensure that reserves for the bridge remain above £2,000,000. Income for the current year from the tags is expected to be around £466,000. A survey carried out before the increases were put forward found that 17% of people wanted to see lower toll charges for local motorists and higher charges for tourists. While 15% of people felt the tolls should be scrapped entirely. The University of Plymouth Students' Union will end its affiliation with the National Union of Students. 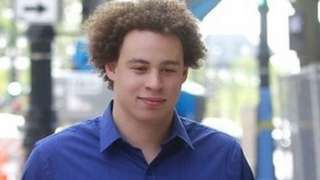 Marcus Hutchins, who faces charges in the US, wants evidence thrown out as he was "intoxicated". Patients at a GP practice closing at the end of the year are being asked to register with another surgery. "Many" patients who attended Phoenix Surgery in Camborne were yet to sign up elsewhere, it said. Earlier in 2018, they were told the surgery was closing on 31 December. Amanda Fisk from NHS England said: "With the onset of winter and the colder weather, Phoenix Surgery patients may need to see a GP or get medicine for illness in the upcoming months. "If they’re not registered with a new practice, they may not be able to get an appointment and this may delay their access to a GP," she added. A popular bus shelter in Fowey has been given a festive makeover. The stop on Polvillion Road was first transformed in 2002 by local resident Jane Tinsley who was fed up with it being attacked by vandals. She turned the drab shelter into a lavish Moroccan retreat, complete with armchairs, cushions, and a floral wall design. Since then it had taken on a number of different themes, with this Christmas creation the latest incarnation. 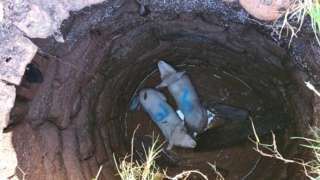 The three-week-old lambs fell into the 20ft well in a valley known as Mrs Bean's Bottom, a farmer says. A shipwreck that is more than 300 years old has had detailed 3D scans for the first time. A recent period of good ocean visibility in Cornwall has allowed HMS Schiedam to be scanned properly, meaning it can now be studied from dry land. The Dutch transport ship was captured by Moroccan pirates in 1683 but was later taken back by British forces before being lost of Gunwalloe Cove, Cornwall on 4 April 1684. A 20-year-old man has been arrested on suspicion of assault after a woman was stabbed in the stomach on Sunday afternoon. Police say the incident happened at about 14:15 in the Mount Camel area of Camelford. 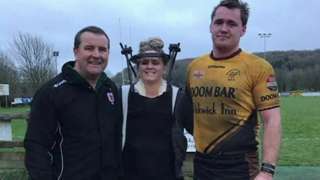 The woman, in her 30s, was taken to the Royal Cornwall Hospital in Truro and it's understood she knew her attacker. The man was found after a search involving the police dog unit and remains in custody. A 25-year-old man's in hospital with life-changing injuries after a hit-and-run collision in Plymouth. Police are treating the incident in Stuart Road at 01:30 on Tuesday 27 November as attempted murder. They are contacting garages which may have been asked to repair front-end damage to a white BMW 330 saloon, registration number WX10 BVO. A police spokesman said: “Anyone with dash cam footage, in particular taxi drivers, who were in the area of Mutley Plain, North Hill, Stuart Road and Alma Road between 01:00 and 02:00 that day are also requested to come forward. Anyone with information is asked to contact police, quoting crime number CR/109778/18.